They’ll be astounded to see your message literally blossom and grow! Logo Bean is a new, innovative way to show off your logo. This amazing bean is a real plant that starts as a jack bean. Your logo is laser-engraved on two opposite sides of the bean. Bean arrives not yet planted, so logo can be seen. The specially designed metal jar contains vermiculite, a pure soil that is bacteria-free and helps to keep the logo clear while growing. Just push bean into the soil and pour water into the container. The bean will begin to sprout leaves in about seven days. To the recipient’s amazement, the logo will appear on the bean plant itself, on each side of the split bean seed. The logo will last about a month, while the plant can live up to a year with proper care (instructions included). White container with silvertone lid is packaged in a clear acetate box. 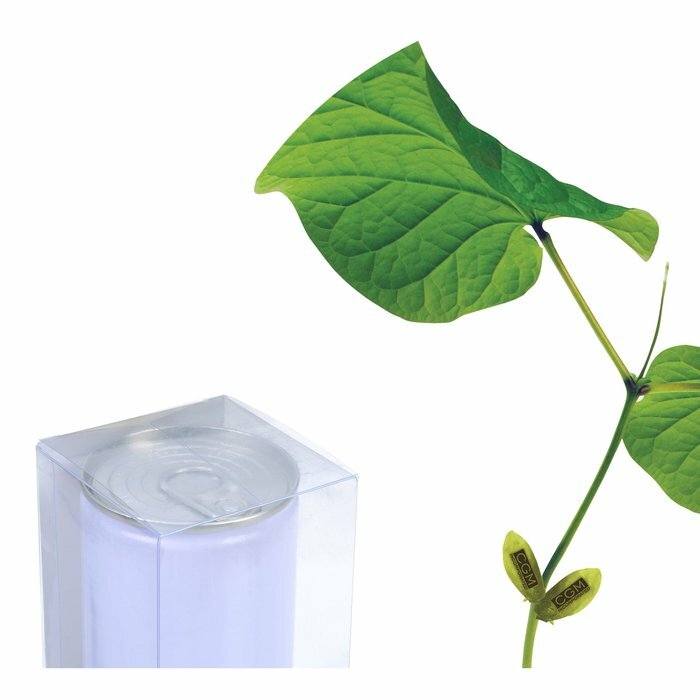 Size: Bean seed is 3 cm; grown bean is 4 cm; jar is 3-1/2" high x 2-5/8" diameter; box is 4" x 2-3/4" x 2-3/4". Your price includes a black laser-engraved imprint on both sides of the bean (PLEASE NOTE: Small and fine logos are not recommended; logo design can be different on each side of the bean seed). TEMPORARILY OUT OF STOCK; (estimated availability no date at this time, sorry!). Ready to ship in : 25 business days *.